The Larson Electronics MGS-208-45K-400-125A power distribution substation converts 208Y VAC three phase electrical current into 400V AC, making it available via an HBL5125RW 125 amp receptacle. This unit provides operators the ability to safely tap into and distribute 208YV AC power from a variety of sources including generators and direct grid power. With this system, operators can connect entertainment related equipment into a 125-amp pin-and-sleeve style Hubbell HBL5125R6W. The MGS-208-45K-400-125A portable power distribution panel provides an effective power source for operators in the entertainment industry. Line in power is facilitated via an HBLMRBK cam-lock style connectors (black, red and blue for line, white female for neutral and green female for ground). The transformer is protected by a 200-amp disconnect fused at 150 amps. The transformer takes 208Y and passes 400V to the 125-amp breaker enclosure. The 125-amp breaker protects a Hubbell HBL5125R6W 4-pole, 5-wire receptacle. The transformer and distribution assembly is mounted onto a rugged, powder coated, carbon steel frame with integrated skid pockets, a top located lifting eyelet, and steel floor transformer mount support. The standard frame is constructed of 2" x 1/8" thick square tubing and powder coated for corrosion resistance. This can be replaced for an additional cost with stainless steel, hot dip galvanized steel, or aluminum depending on the customer`s needs. This power distribution system is weatherproof and ideal for outdoor use and applications including but not limited to, plant maintenance, welding stations, shows, exhibits and marine applications. 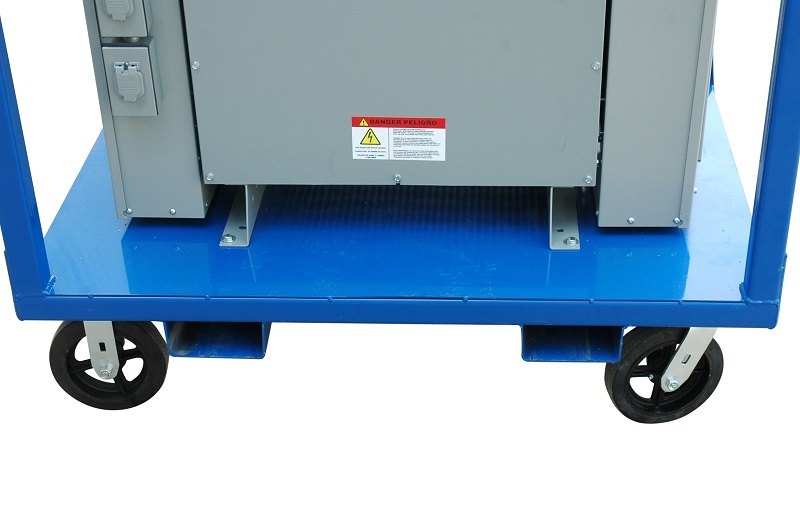 In addition to the top pick-eyes and skid pockets, this power distribution system includes a set of four 8-inch polyurethane casters (2 locking and 2 swiveling) that enable the operator to easily move and position the portable power distribution system. This unit is rated for outdoor use.